Time Bites is an original, premium brand of hand made chocolates, designed with unique and intricate designs of pre-historic fossil creatures and dinosaurs. As a new business venture, Time Bites needed to create a distinct brand that would represent the hand-made premium nature of their chocolate products and launch them into market. Selling online would be key to acquiring new sales and so an ecommerce website would be required, alongside packaging, all of which needed to portray a consistent representation of the new brand. Veucom created a distinct brand for the chocolates brand, featuring a woodcut style representation of an ammonite fossil. A full range of packaging was designed, from chocolate boxes to point of display and labelling. Veucom then set about producing an ecommerce website capable of handling chocolate sales with multiple postage and carrier rates. 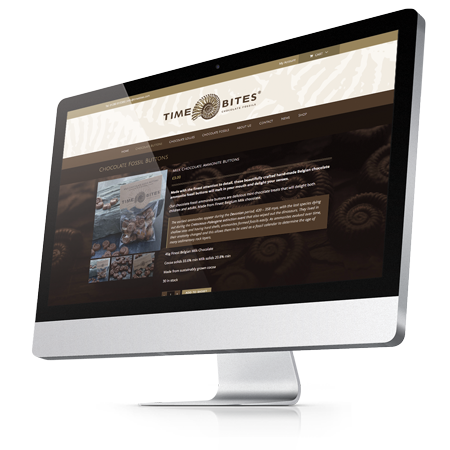 With a new domain name – timebites.com – the new website needed optimisation to enable it to appear high up in search engine rankings, helping to generate sales of the new range of chocolates. Veucom created a distinct brand for the range of chocolates, featuring a woodcut style representation of an ammonite fossil. Using earthy colours and tones combined with uncoated, fibrous stock, Veucom created a range of premium, rustic looking packaging including Chocolate Boxes, Point of Sale and Labelling, all featuring the new brand identity. In addition to niche sales outlets, such as the Natural history Museum, Time Bites wanted to bring their new range of hand made Chocolates to market using on an online store. Veucom set about creating a new website which included their full product range and an ecommerce facility to enable the purchasing of their chocolates. The new brand design proved a hit with the client and several high profile outlets took stock of the chocolates range using the newly designed point of sale. The brand and website has facilitated the securement of retail outlets from the Natural History Museum to overseas pop-up stores, whilst the e-commerce facility has meant online sales have proved successful. The website has performed extremely well for the key search terms, including a number one google listing for ‘Chocolate Fossils’.